MSP GILLIAN MARTIN SIGNS A PETITION TO KEEP THE RBS BRANCH IN TURRIFF OPEN WITH (L TO R) ANNETTE STEPHEN, COMMUNITY COUNCIL, MARGE CHALMERS, TURRIFF AND DISTRICT BUSINESS ASSOCIATION CHAIR, CLLR ALASTAIR FORSYTH AND COMMUNITY COUNCILLOR ROSE LOGAN. 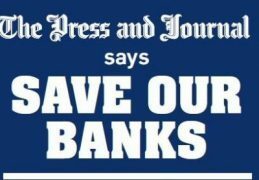 The fight to save two north-east banks is gathering momentum, according to the organisers of the twin petitions. 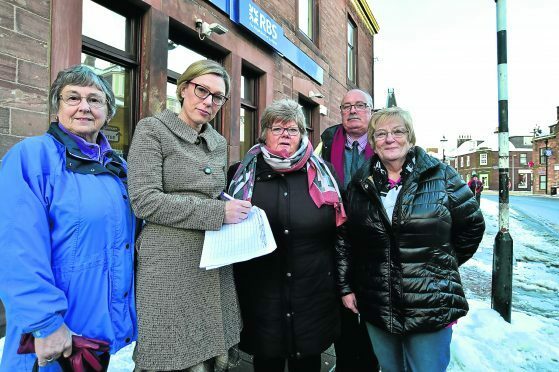 Turriff Business Association launched a petition calling for Royal Bank of Scotland to reconsider its plans to close the branch earlier this month. Although no update could be given on the number of signatories, the calls for a U-turn does have the support of former RBS employee councillor Alistair Forsyth and Aberdeenshire East MSP Gillian Martin. Marj Chalmers from TBA, which is made up of around 60 companies from different sectors, decided to act when the lender announced it would shut the Turriff facility as more customers switch to online services. The paper petition has been placed in several businesses around the town. She said people were “angry” that they face losing the High Street branch on June 26 next year. She added: “I’ve got a petition in my shop and I have filled six A4 pages with signatures. “People are really angry just because it is not easy to travel to New Deer (the closest branch) from Turriff because there is only one bus a day and a lot of people can’t drive. “It is a complete area they are cutting and it isn’t easy to get to the ones they are leaving open. Banff is the other north-east town battling to save its RBS branch. Its doors are due to close for the final time on May, 23 2018. SNP councillor Glen Reynolds decided to take up the fight against bank bosses and organised a protest march and an online and paper petition. He said: “At the moment, specifically in relation to Banff, we have about 200 signatories which we are really pleased at because it has been difficult period for people venturing out with the weather.